Most of the supplies I used for this project are linked in the list at the bottom of this post. To add more texture to the dress, I used the jeans texture technique. A few months ago, I made a step-by-step tutorial for MFT. You can find it HERE (check page 2). The sweet little bird is from the Dashing Deer set. The sentiment is from the Celebrate with Cake stamp set. The yellow dotted paper is from the Lucky Prints paper pack. I created the window using the Inside & Out Stitched Circle STAX Die-namics. 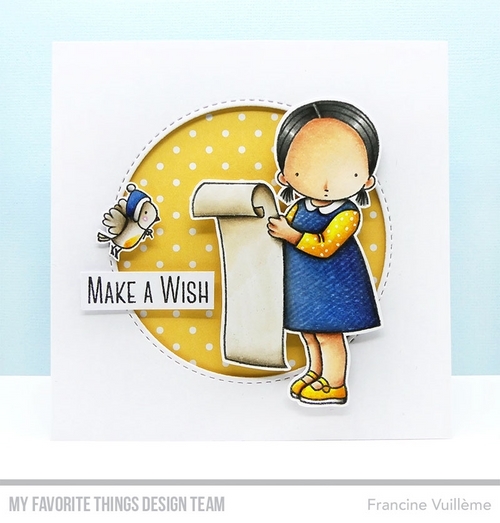 Such a sweet card, Francine! I love your color combo and how you added texture to her dress...simple, yet charming! Sweet combination of elements- the birdy is a great addition to the Christmas list girl! This is such a sweet card ! So precious little girl ! Love the added texture you created on her dress - a beautiful card! Amazing coloring and super sweet card!Thank you for the inspiration!